SJ Wolfe Racing's exciting three-year-old Three Secrets launched himself into WA Guineas contention with a strong victory in the TABtouch Plate (Race 3-1500m) at Ascot today. 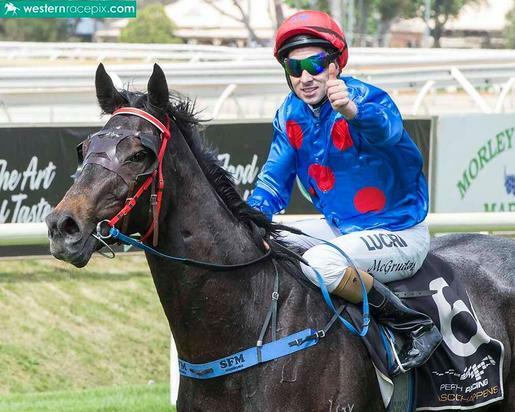 The Group 2 $500,000 WA Guineas (1600m) is held at Ascot on November 25 and the strapping son of So Secret threw his hat into the ring, scoring a deserved victory after chasing home highly-rated youngsters Rockon Tommy and Sophia's Secret at his first two starts. Three Secrets was afforded every opportunity by Wolfe stable jockey Shaun McGruddy, settling in the sweet spot behind the leading pair and being put into the race with momentum from the 600-metre mark. The former $135,000 yearling purchase was able to dig deep late to withstand the finishing burst of Roganella, and then had to hold onto the race in the Stewards Room with Roganella's connections lodging an unsuccessful protest for interference in the straight. Three Secrets is now qualified for the WA Guineas and the stable are keen to bypass the Fairetha Stakes (1400m) at Ascot on November 11 and head straight into the half-million dollar feature. Being Westspeed Platinum nominated, Three Secrets pocketed a $37,500 bonus payment today, to go along with the $36,000 prizemoney, taking his earnings to $82,500 from only three starts.